This object is on display in the Concourse - 1st Floor at the National Air and Space Museum in Washington, DC. During the Apollo 11 mission, Magazine R was used inside the lunar module "Eagle" with an electric Hasselblad camera. The color images printed from this magazine include moments from inside the lunar module during undocking from the command module "Columbia" and continue through the crew's return to the spacecraft after their historic EVA to the lunar surface. No images from its film roll came from outside the lunar module. This magazine and the camera it attached to were modified with a silver metal exterior to repel the solar rays that could easily overheat and destroy this sensitive equipment on the lunar surface. 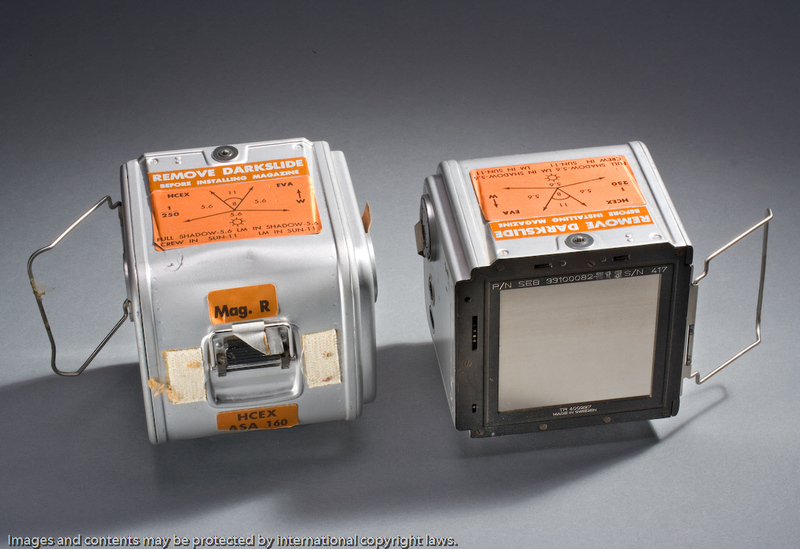 Hasselblad cameras and magazines, selected for their reliability and high quality, were used on all lunar missions. The magazines were easily switched out at any time, allowing crew members change between color and black and white film at a moments notice. NASA transferred this film magazine to the Museum in 1970.